We are pleased to offer the Signoria Masacci0 in 20 gorgeous colors. Available as a sateen quilted coverlet and quilted shams in colors suitable for any decor. The colors are: Airforce Blue, Black, Bourdeaux, Camelia, Caramel, Coffee, Cognac, Espresso, Ivory, Lead Grey, Midnight Blue, Moss Green, Pearl, Plum, Rust, Silver Moon, Taupe, Thistle, White, Wilton Blue. 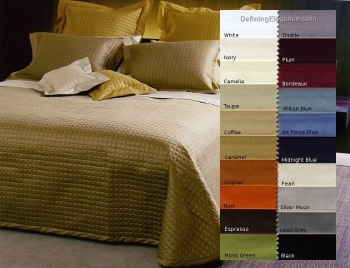 DefiningElegance.com announces the addition of bedding and table linens from Leitner to our product offerings. Leitner is an Austrian company devoted to the time-honored production of linen since 1853. 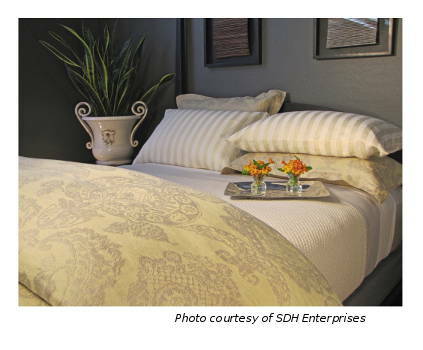 Their linens are superior in quality and much in demand throughout the world. We were struck by the intricate weave and the tender shades in various hues of the fabrics. We offer a large selection of Leitner linens, so whether you are looking to dress your bed in the finest linens or hosting elegant dinner parties, you’re sure to find just the right style and color for your needs. Lucia is a printed floral and stripe bedding collection from RB Casa in Egyptian cotton percale with satin stitch detailing. 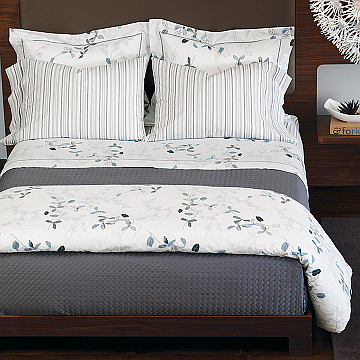 Pair with RB Casa Venezia quilted covers and shams for texture and interest. 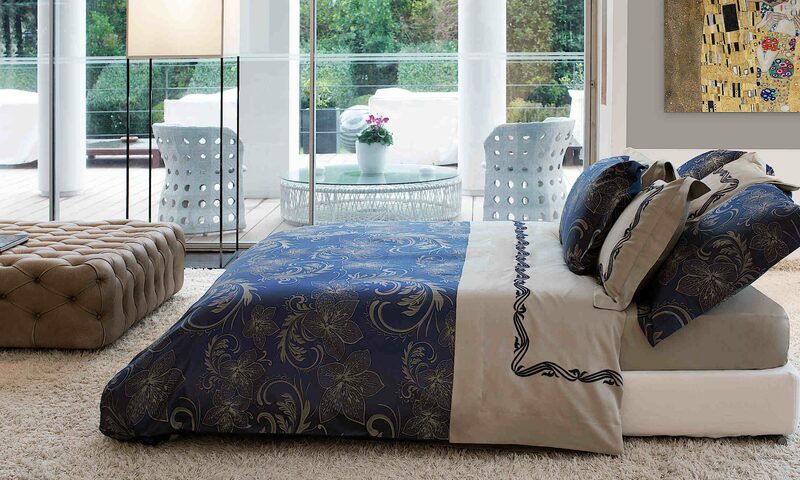 Errebicasa – RB Casa Lucia Percale Bedding now available at DefiningElegance.com. 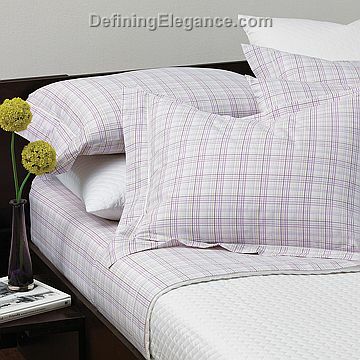 The RB Casa Clan Percale collection offers a plaid in the understated colorways of Celeste Blue, Lilac, and Pink. The collection is versatile enough to be paired with the RB Casa Cristal collection, a floral suitable for feminine décor. Clan may also be paired with the RB Casa Venezia quilted collection in coordinating solid colors for a more masculine look. 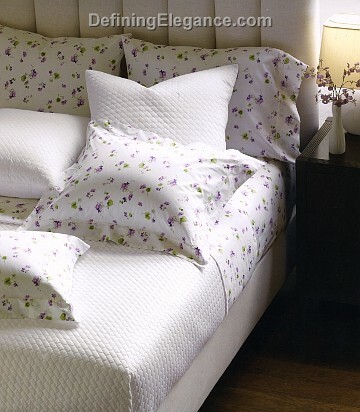 Dress your bed in this very soft and feminine floral and you’ll wake up to a bouquet of fresh flowers every morning. The Cristal collection by RB Casa offers Egyptian cotton percale sheets, cases, shams, duvet covers, and bed skirts adorned with beautiful delicate flowers with one line of white satin stitch detail in three colorways: Celeste Blue, Lilac, and Pink.